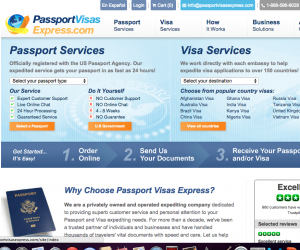 Passport Visa Express is a high quality travel document expediter service that will help make sure that your big international trip is not delayed, at least as far as your important paperwork is concerned. While it is true that the standard processing time for new passports, renewal passports and various types of travel visas can be six to eight weeks during the peak travel season, Passport Visa Express can have all of these documents and more in your hand in as little as 24 to 48 hours. Note that expedited processing fees will be required on top of the standard application processing fees that you would have to pay if you were submitting your documents through normal channels at an embassy or consulate. 2 Chicago 431 South Dearborn St.